The sleek and sophisticated 1.28 oz Nano 5th Generation is extremely light-weight and easy to carry. Now Apple iPod lets you capture your favourite moments in 14,000 photos and 16 hours of video with fifteen fun effects with the upgraded built-in video camera. This 16 GB mp3 player lets you store 4,000 songs in AAC, AIFF, Audible, MP3, VBR and WAV formats. 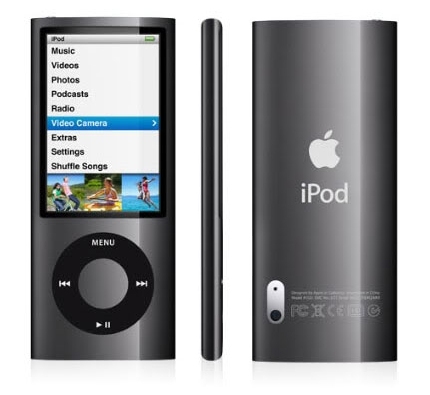 Listen to music all day long without any interruption as this Apple iPod has up to 24 hours of music playback and 5 hours of video playback with one single charge. 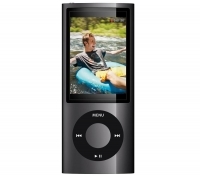 Besides listening to radio this 16 GB mp3 player lets you pause, rewind and tag it too. The polished anodized aluminium finish gives this glossy black Nano 5th Generation an extra shine.